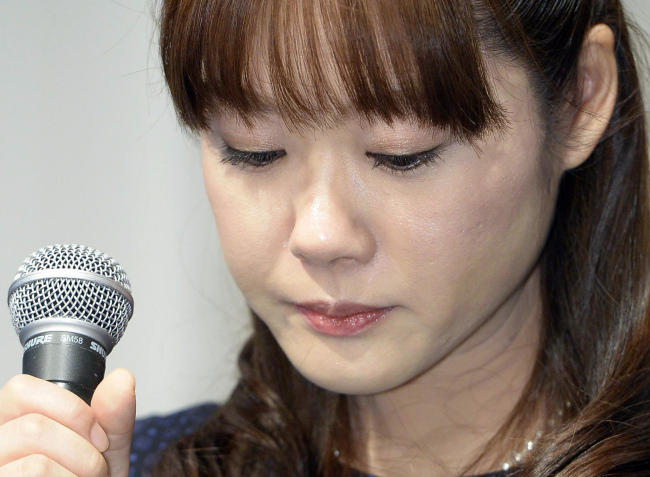 TOKYO (AFP) ― A young female scientist accused of fabricating data made a tearful apology live on Japanese television Wednesday for “mistakes” in her research, but insisted her ground-breaking conclusions on stem cells were accurate. Haruko Obokata, 30, blamed her youth and inexperience for errors in her methodology, but said she had managed to create the building-block cells capable of growing into the specialized cells of the brain, liver, heart or kidneys. “I apologize with my whole heart to my coauthors ... and many others for causing trouble because of my insufficient efforts, ill-preparedness and unskilfulness,” a visibly shaken Obokata told a press conference. “To many people there may be too many unbelievable mistakes, but that does not affect the conclusion,” she said. Obokata was feted as a modern-day Marie Curie after unveiling research that showed a simple way to reprogram adult cells to become a kind of stem cell. So-called Stimulus-Triggered Acquisition of Pluripotency cells were hailed as a breakthrough that could provide a ready supply of the base material for much-needed transplant tissue at minimal cost. Campaigners said it represented a leap forward in the fight against degenerative diseases. Her profile ― a young woman in a world dominated by middle-aged men ― was seized on by Japan’s media, which was charmed by eccentricities that included her insistence on wearing a housewife’s apron in the laboratory, instead of a white coat. But within weeks of her paper being published in the prestigious journal Nature, questions began to emerge, with fellow scientists saying they were unable to replicate her results.